Public Health Madison & Dane County is offering free private well water testing to impacted Dane County residents following last week’s floods. Flooding on East Washington causes a bottle neck at Livingston St.
Torrential rains flooded many parts of west Madison and Dane county last week, causing both Gov. Scott Walker and Dane County Executive Joe Parisi to declare states of emergency. In response, Public Health Madison & Dane County (PHMDC), a local health department run by Dane County, announced Monday that it is teaming up with the Wisconsin State Lab of Hygiene and Wisconsin Department of Health Services to offer free and expanded testing services to private well owners affected by the floods. 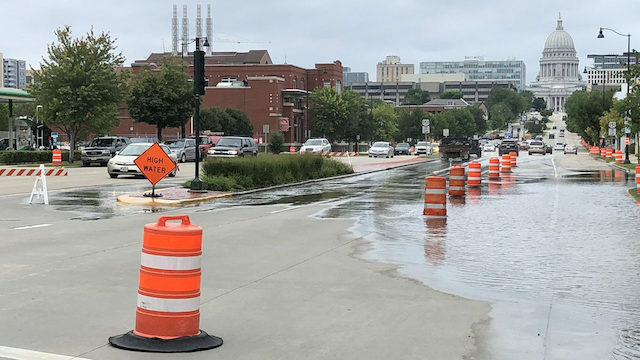 The National Weather Service in Milwaukee reported that an estimated 11-15 inches of rain fell from Monday afternoon to Tuesday morning. If confirmed, it is the heaviest rainfall in 24 hours since 1946, when Mellen, Wis. received 11.72 inches of rain. Initial damage estimates exceeded $100 million, according to a Tweet by Parisi. Dane County Emergency Management officials evacuated residents in towns near Madison, including Black Earth and Mazomanie, in response to overflowing rivers and rising waters. The heavy rains washed away parts of Highway 14, which runs west from Madison. For more information, see PHMDC’s full announcement here. The City of Madison began laying the groundwork for updates to the historic Mifflin Street neighborhood with its 2012 Downtown Plan, but from then until 2018, not much happened. Plans were made and forgotten, sometimes conflicting with each other along the way. A regional planning commission is surveying Madison-area residents to discover how communities would like the city to change in the future. The project, called “A Greater Vision Madison,” was unveiled on September 12 and will ask residents of Dane County and other bordering counties what their priorities for the future are related to society, the environment, population and technology, according to Alder Larry Palm, Chair of the Capital Area Regional Planning Commission.